We are looking for a team of sidekicks to help the Ashton Events and Haus 820 staffs in the fall of 2018. We’re searching for dynamic, motivated individuals eager to get hands-on experience in the creative event industry. 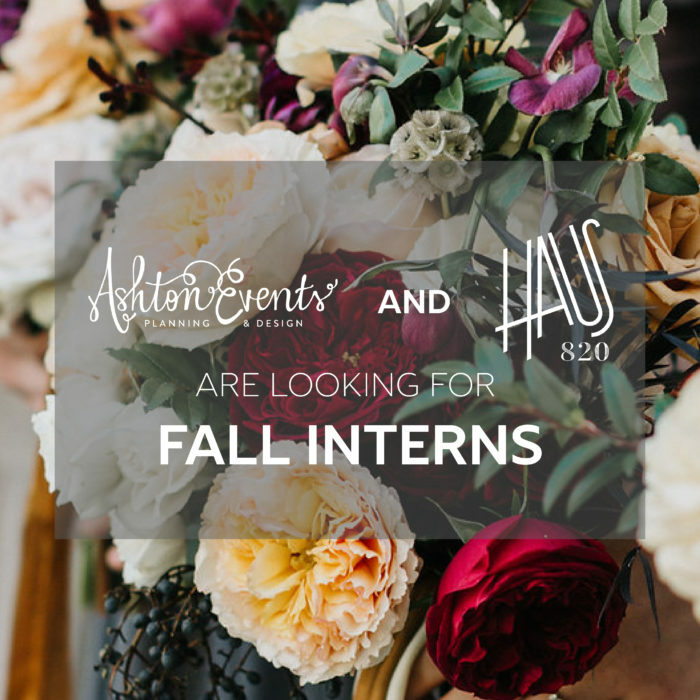 Whether your interest is in event management, design, florals or just dabbling in a mix of creative jobs, our semester-long internship program is designed to give you a wealth of knowledge and opportunities. We promise informative field-trips, hands-on projects and a detailed curriculum. Possible opportunity to extend internship and/or employment within the company. Please note that you must be available to work out of our downtown Lakeland office. To apply, create a pinterest board (your 20 best pins!) that explains why you would be a superb sidekick for Ashton Events. Send a link to the board, (creativity & ingenuity is enthusiastically encouraged!) as well as a short resume, to Sarah@AshtonEvents.com. The application deadline is Friday 4/06/18. We will be in touch with applicants by April 10, 2018 to set up interviews and discuss this position in more detail. We can’t wait to hear from you! HIP HIP HOORAY! LET’S DO THIS!